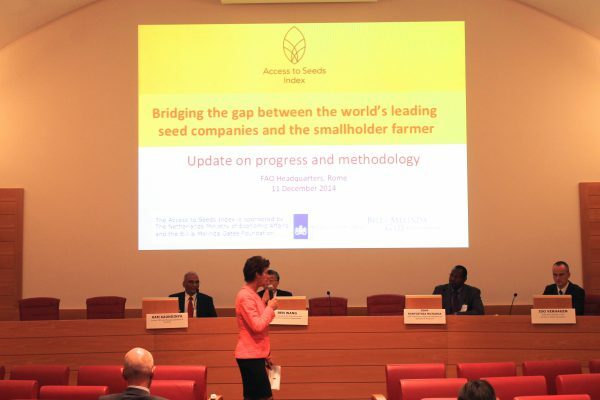 On December 11, 2014 the development process and methodology for the Access to Seeds Index 2015 was presented at the FAO’s headquarters in Rome. The aim of the initiative was broadly welcomed while the Index itself was viewed as an effective tool to measure the performance of seed companies in increasing access to seeds for smallholder farmers. An interactive panel discussion was moderated by Gerda Verburg (Ambassador and Permanent Representative of the Kingdom of the Netherlands to the FAO). Together with other permanent representatives and staff of the Rome-based UN agencies, the members of the panel, consisting of Ren Wang (Assistant DG Agriculture and Consumer Protection Department of the FAO), John Mutunga (CEO of the Kenya National Federation of Agricultural Producers), Ram Kaundinya (former CEO and Managing Director of Advanta) and Ido Verhagen (Executive Director of the Access to Seeds Foundation), shared their perspectives on the Index. They agreed that the Index should highlight best practices in the industry and encourage seed companies to demonstrate stewardship. Next year, the Access to Seeds Foundation will return to Rome to present and discuss the outcomes of the Access to Seeds Index 2015.